In his popular book The Presentation Secrets of Steve Jobs, Carmine Gallo shares techniques which made Steve Jobs a great presenter. The Steven Spielberg of presentations is what Gallo calls Steve Jobs. So what made Steve Jobs great? The answer is simple. While most other professionals share information in their presentation, Jobs created an experience. An experience which left his audience informed, entertained and thrilled. You too can rise above the ordinary and present much better if you follow what Steve used to do. The book is divided into three parts; Create your story, Deliver the experience and Refine & Rehearse. I have carefully chosen 15 things which you can start doing immediately. If you are excited by what you read next, go ahead and buy the book. It's worth it. I give it 5 stars out of 5 because the book is full of practical ideas which can be used by any one of us. 1. Plan in analog: Steve Jobs never started with the software and neither should we. Start on a piece of paper and plan out everything. What will you say, how will you say and when you will say that. Once you are completely ready, open the software. 2. Have a headline: Every presentation has one big idea. Find out what that is and articulate it in one sentence. If your audience could remember one thing, what will it be? For Mac Book Air it was 'the world's thinnest notebook". For iPod it was '1000 songs in your pocket'. This is the crux of what you have to say. Write this and share it multiple times in your presentation. 3. Why should I care? : Your audience is asking itself this question as soon as you start your presentation. Why should I care to what is being presented? Give them the answer and give it early in the presentation. Tell them how you are going to make their life better (or solve their problems). 4. Be passionate: This is perhaps the single biggest reason by Steve Jobs was the best presenter. He loved what he did and he did what he loved. Only when you have passion will you touch your audience emotionally. Passion is infectious. Have passion and you're already 80% there. 5. Twitter-like headlines: We talked about one big headline. This point is slightly different. For every aspect of your presentation have a simple one sentence explanation. You must be able to explain every idea, chart, graph or concept in one simple sentence. This enhances audience understanding and make messages memorable. 6. Roadmap: The audience needs to know what's in store. Help the audience keep track of what you are going to say and what you have already said. Jobs did not use agenda slides. He used to share it with words. 7. Introduce a villain: Every story has a villain. Find yours and introduce it to your audience. It can be a competitor (like IBM for Jobs) or a problem (like rising costs in your company). Start with the bigger picture and bring the villain. Now go ahead and show them how to conquer the villain and bring in the hero (the idea you are selling). 8. Ten minutes: The attention span of your audience is only 10 minutes at a stretch. After every ten minutes, change track. Introduce a video, give a demo, bring in a new speaker or make the audience do an exercise. Do what applies to your case but understand that holding attention for more than 10 minutes on one thing is impossible. 9. Simplicity: Simplicity has been the central theme of all Apple products and it shows in Jobs' presentation as well. Use simple English words, no jargon. Use simple slides. The lesser the words the better. Have only one thing to say per slide. 10. Slide tips: Research has proven that words and pictures used together are better than words alone. It is called the Picture Superiority Effect. Pictures are superior than words. When using words and pictures together, place the words closer to the picture. Use very few words and pictures on your slide. Jobs never used to have many words on a slide and almost all his slides had a picture. 11. Dress up your numbers: Numbers by themselves are tough to comprehend especially if they are big. Convert your number into something specific, relevant and place it in a context which is easy to understand. Jobs did not say iPod had 5 GB storage. He said, "1000 songs in your pocket." 12. Use props: We started by saying our presentation should be an experience. Using props will make your presentation a multi-sensory experience. Why only hear and see why not touch and feel as well. Find out how can you engage the other senses. Jobs could circulate the new Mac Book Air and let people touch and feel it. What can you circulate in your audience? There has to be something. 13. 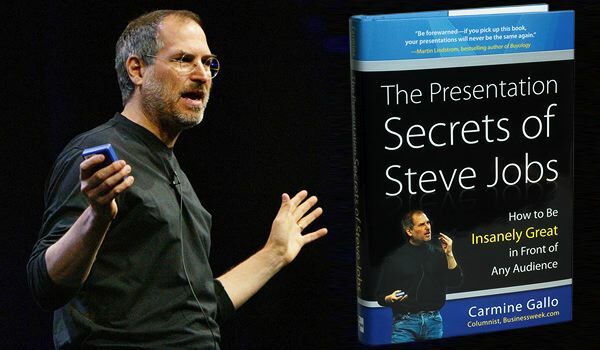 Rehearse & rehearse: This is the biggest secret of Steve Jobs, the presenter. He practised very hard for every presentation. He did mock runs many many times over until he perfected it. It is better not to have notes. Never read from notes or slides. Rehearse so well that you know the content. While rehearsing you can use notes which have only keywords. Later get rid of the notes and rehearse without them. Video record yourself and improve your body language and voice modulation. Seek feedback from friends/colleagues. On body language: Establish eye contact with your audience. Have an open gesture. You can move around. Do not get stuck behind the podium. Move hands as your normally do. Be totally normal as if you are talking to a bunch of people in your canteen. 14. Be natural: When you present you must remain who you are. No fake accent. No unnecessary jargon. Speak the way you speak always; simple English words. Don't be too fast. Stay calm and composed. 15. Have fun: No matter what enjoy the presentation. Not everything will happen as per plan. It's okay. Don't get tense and don't worry. If you have practised enough you will not have stage fright. You will do well. If something does go wrong, move on. Don't focus your audience on the problem at hand. There is so much stuff in this book that I would like to dedicate a few more posts exploring it. As of now, all you must do is to buy the book. Click here to buy on Amazon and here to buy from flipkart. Carmine Gallo, the author, has recently shared 10 tips from the book. Click here to read his article. Tell me how you feel reading the techniques which Steve Jobs used? How will you apply this in your next business presentation?